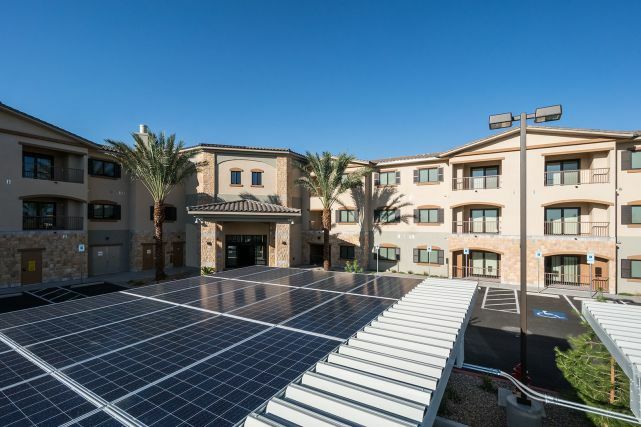 August 15, 2017 - Las Vegas, Nevada: Accessible Space, Inc. (ASI) is pleased to announce that Patriot Place Apartments, an accessible, affordable supportive housing community with a priority preference for qualifying U.S. Veterans opened its doors after 14 months of construction on July 28, 2017. Located at 4245 South Pecos Road in Las Vegas, Patriot Place Apartments has 41, one-bedroom and 9, two-bedroom apartments which respectively provide 730 sq. ft. and 960 sq. ft. of living space. Patriot Place Apartments provides rental assistance/subsidy which will ensure that resident paid rents are truly affordable, thanks to Project Based Vouchers provided by the Southern Nevada Regional Housing Authority (SNVRHA). In addition, 13 apartments are fully furnished and set-aside specifically for low-income veterans with a disability and who are facing the challenges of homelessness. With special funding from the Veterans Administration Supportive Housing Program (VASH), ASI is honored to be the first affordable housing community in Nevada to provide permanent supportive housing and project-based, VASH vouchers at Patriot Place Apartments. A service-enriched, permanent supportive apartment community, Patriot Place Apartments offers a wide range of supportive housing services to residents, including: information/referral services; social and recreational activities; case management services; vocational, educational, and life-skills training services; and accessible, round-trip transportation to local retail outlets three times each week. Services will be available from a variety of providers, including Nevada Partners, ASI’s Nevada Community Enrichment Program (NCEP), and the Veterans Administration (VA). ASI will also provide an on-site Service Coordinator along with on-site management and maintenance personnel. Patriot Place Apartments offers a large, multipurpose community room with a warming kitchen, a hobby/activity room, computer lab, a library, an exercise room, and therapeutic spa rooms with walk-in tubs for resident use. A large outdoor courtyard and patio with a pergola and ample shaded seating, as well as an outdoor BBQ grill provide additional exterior common areas for resident use. All interior and exterior common areas at Patriot Place Apartments are designed to maximize wheelchair accessibility, including a hands-free controlled access main entrance, oversized elevator with accessible call buttons, automated push-plate or power-assisted doors, automated trash chute, six-foot wide hallways, and fully accessible public rest rooms. Twenty-five apartments are fully wheelchair accessible and include custom-designed, oversized roll-in showers, adjustable closet shelves, roll-under counters and sinks in the kitchen and bath, and front loading washers and dryers, among other amenities. ASI gratefully acknowledges the following organizations for their funding and/or support of Patriot Place Apartments: Nevada Housing Division Low Income Housing Tax Credit Program; Clark County Community Resources Management HOME Program; Federal Home Loan Bank of San Francisco’s Affordable Housing Program/City National Bank; Wells Fargo Bank Priority Markets Grant; US Bank National Association; US Bancorp Community Development Corporation, Southern Nevada Regional Housing Authority; Veterans Administration; Nevada Partners, and Nevada Community Enrichment Program.